What do we mean by “the Universe”? 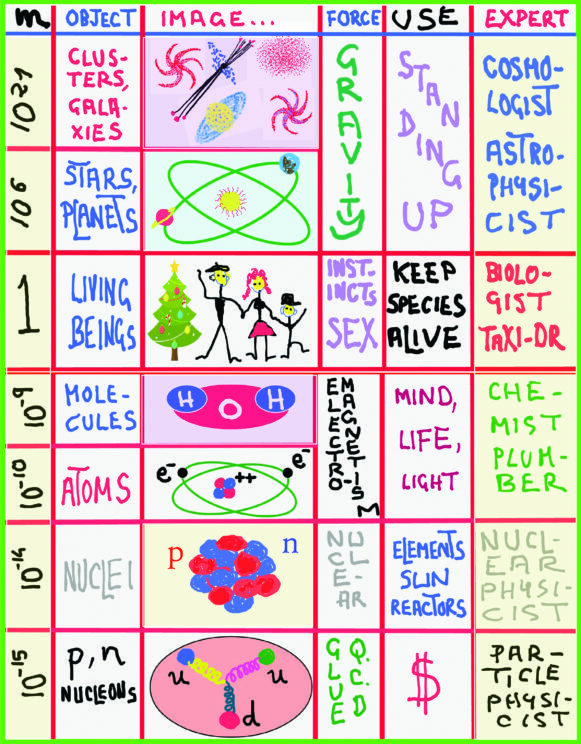 In the physics community, we would define “the Universe” as all “observable things”, ranging from the entire cosmos to stars and planets, and to small elementary particles that are invisible to the naked eye. Observable things would also include recently made discoveries that we are slowly coming to understand more, such as the Higgs boson, gravitational waves, and black holes. While it might take incredibly complex (and costly) instruments to prove that these phenomena occur, we are able to witness them and prove their existence. As a fundamental understanding of our Universe is being developed, it is clear we are currently only exploring our Universe, since the hypothesis of the multiverse is yet unproven. Our unique and complex world stills holds many mysteries but those spectacles that have been documented over time show the beauty in the physics of our Universe. Here we present several original illustrations by Alvaro De Rújula that take us on a little tour of the “observable things” that make our Universe beautiful. 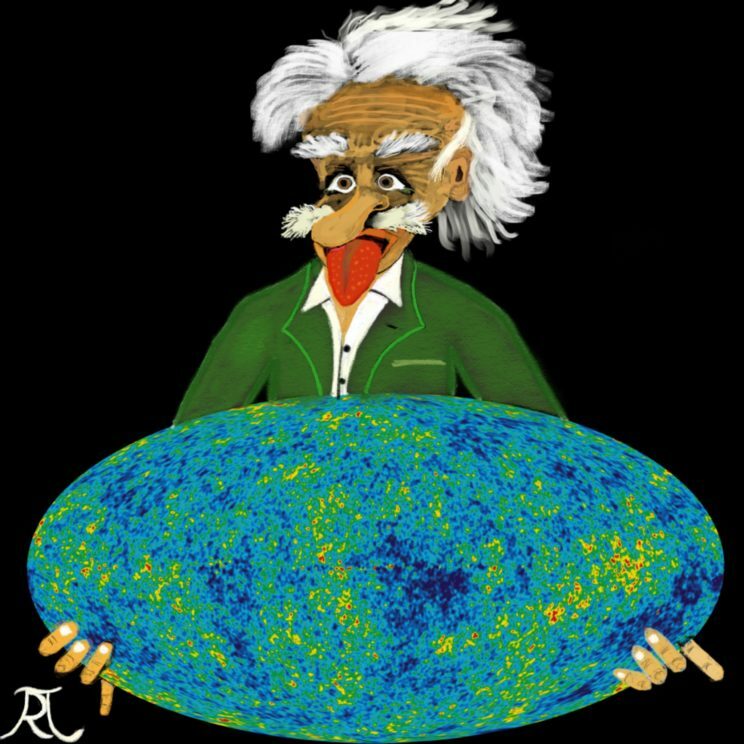 Albert Einstein holding the visible Universe, to whose current understanding he contributed so significantly. Image credit: Albert Einstein by Alvaro De Rújula. The visible universe CC-00 via WMAP/NASA. Used with permission. 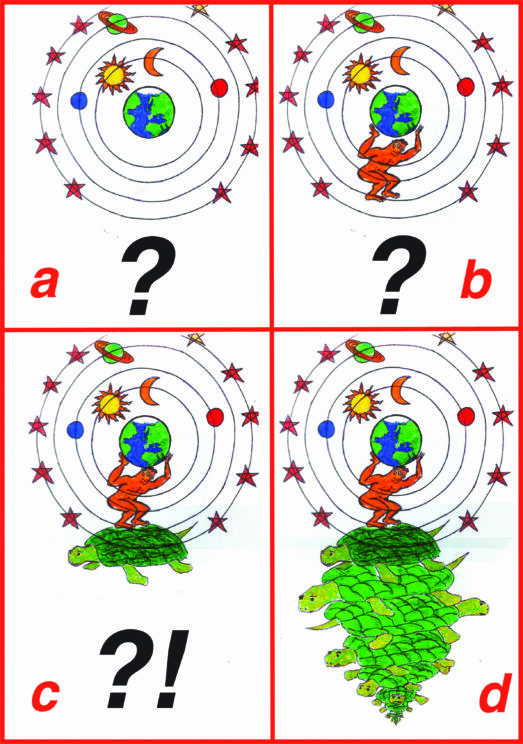 On the lower one, the left-hand side describes gravity, the right-hand side its “source.” The symbols c and G are the speed of light and Newton’s constant, which determines the magnitude of the gravitational forces μ and ν are “indices” that “run” from 0 to 3 for time and the three dimensions of space. The 8 and π are other rather well-known numbers. 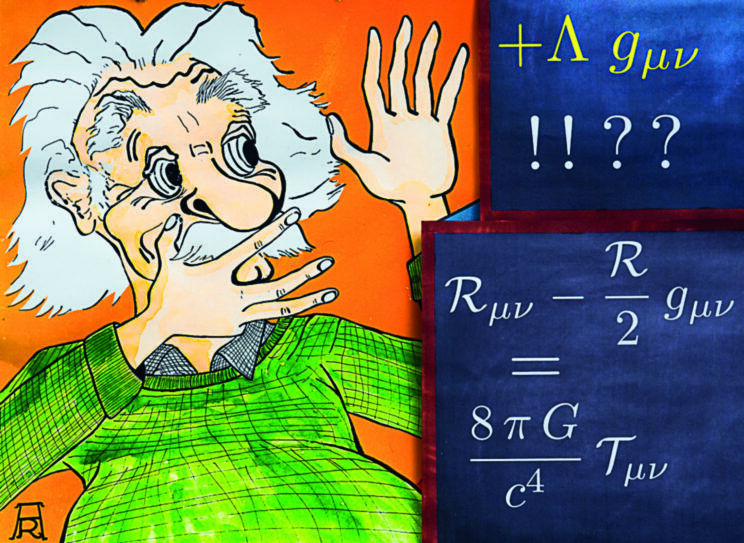 Image credit: Albert Einstein and his blackboards by Alvaro De Rújula. Used with permission. 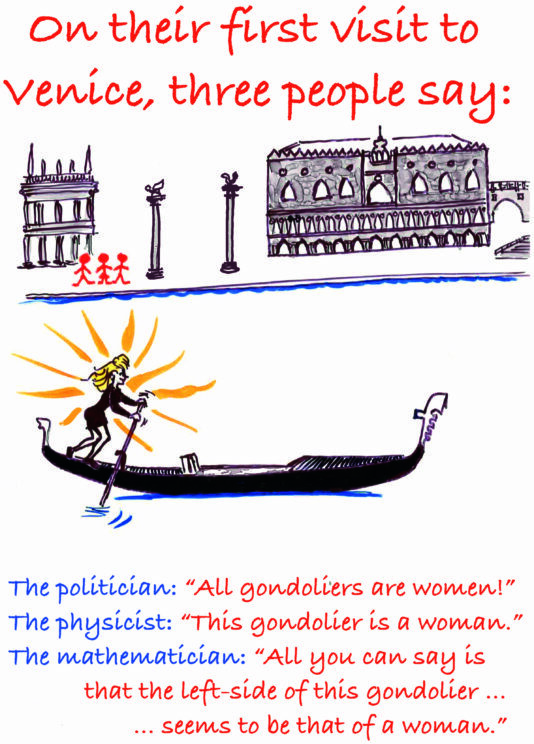 Image credit: The diverse perceptions of different professionals by Alvaro De Rújula. Used with permission. 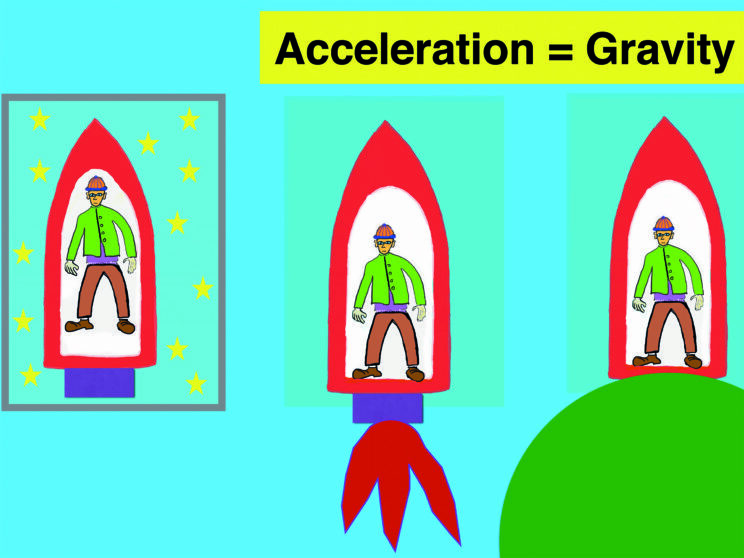 The guy in the rocket would be floating in it (if in a region with no significant gravitational forces), or if he and the rocket were in free fall in a gravitational field, as astronauts are in the Space Station (left). If he is in an accelerating rocket (middle) or at rest in a gravitational field (right) he cannot tell unless he cheats (by looking out of a window). Image credit: Acceleration = Gravity by Alvaro De Rújula. Used with permission. Typical sizes in meters are shown on the left-most column. Three of the four known fundamental forces are listed (the weak force does not play a role in stabilizing material objects). Nuclear forces binding protons and neutrons in nuclei are a consequence of the more fundamental Quantum Chromodynamic interactions between quarks. Analogously, chemical forces between atoms are a peripheral manifestation of the Quantum Electrodynamic forces between electrons and nuclei. Image credit: All things made out of “ordinary” matter. by Alvaro De Rújula. Used with permission. The sizes of “all” things, on a logarithmic scale in centimetres. The Large Hadron Collider has a radius of about 7 km. A caviar egg, a few millimeters. Spain has a geometric (or logarithmic) average size, in the ensemble of all sizeable things. 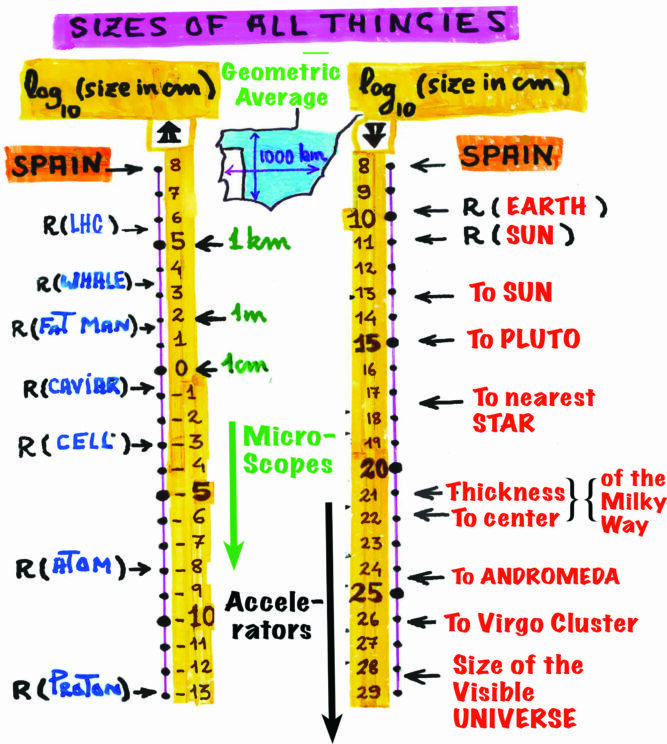 Image credit: The sizes of “all” things, on a logarithmic scale in centimetres by Alvaro De Rújula. Used with permission. Large distances, compared to the full sixe of our Galaxy, represented by a 5 Swiss-Franc coin. A quasar is a gigantic black hole, visible from afar given the intense luminosity of the jets it spits out as it swallows the central areas of its “host” galaxy. Virgo is the cluster of galaxies to which we belong. The ratio of the sizes of the Galaxy and the visible Universe equals that of the coin and the LHC. 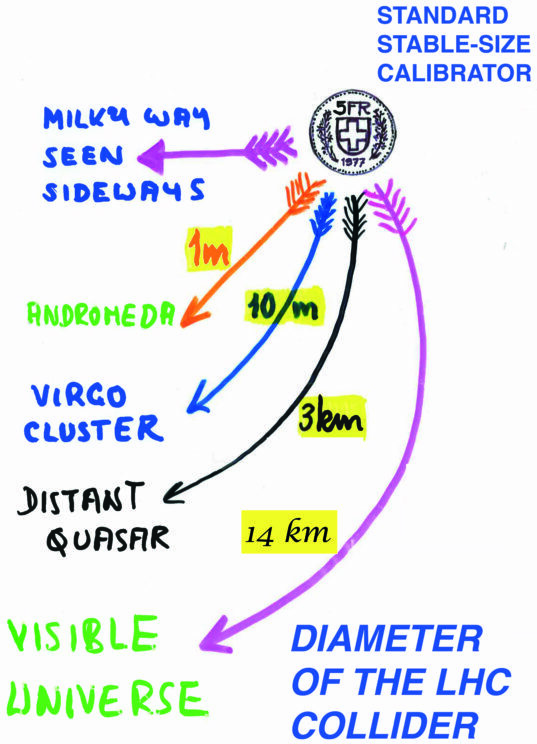 Image credit: Large distances by Alvaro De Rújula. Used with permission. Newton’s laws of the equal but oppositely directed forces of action and reaction (top). Newton’s apocryphal apple leading him to discover the relation between force, mass, and acceleration (F=Ma) (center), as well as the expression for a gravitational force between two objects, in terms of their masses and the distance between their centers (bottom). 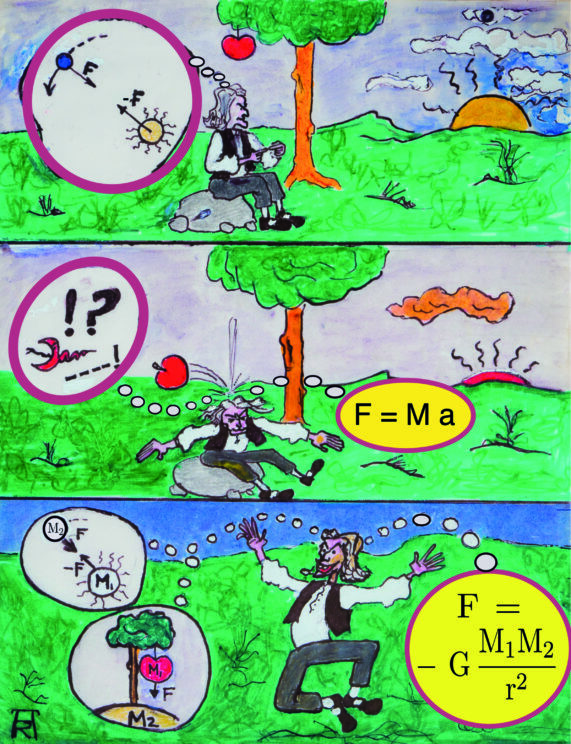 Image credit: Newton’s laws by Alvaro De Rújula. Used with permission. Faraday’s failed experiment on what would have been this second law of induction (of electricity by gravity). The (super?) string may have been premonitory. Many of Faraday’s instruments are preserved at the Royal Institution in Mayfair, London. 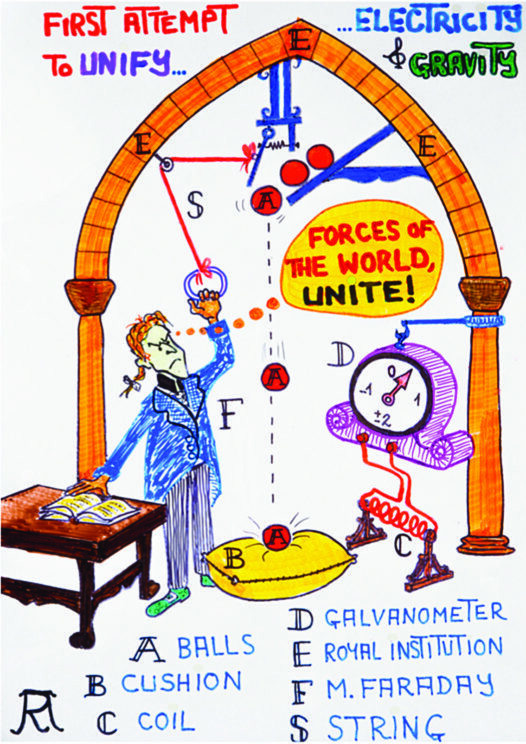 Image credit: Faraday’s failed experiment by Alvaro De Rújula. Used with permission. Image credit: A dialog with an incorrect conclusion by Alvaro De Rújula. Used with permission. 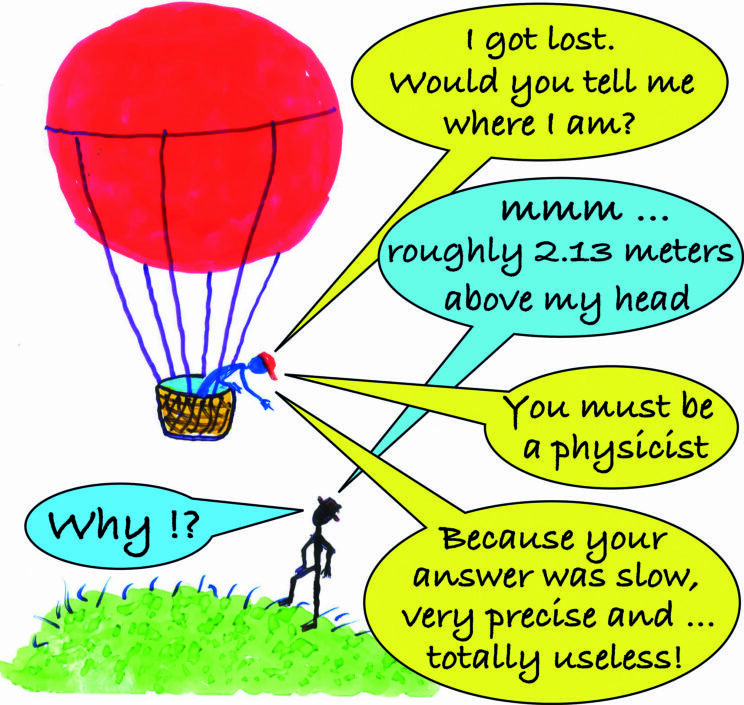 Image credit: Ancient views on gravity and the Universe around us by Alvaro De Rújula. Used with permission. Featured image: “Milky Way Universe Person Stars Looking Sky Night” by Free-Photos. CC0 via Pixabay. Alvaro De Rújula was born in Madrid, where he studied physics and obtained his PhD. He has worked in Italy (International Institute of Theoretical Physics, Trieste), France (Institut des Hautes Études Scientifiques), the USA (Harvard and Boston Universities) and CERN (in various positions, from Summer Student to leader of the Theory Division). He also is currently at the Instituto de Física Teórica of the Autonomous University of Madrid (IFT/UAM/CSIC). In the 1970's he contributed to the consolidation of the Standard Model of Particle Physics, mainly QCD and its charmed quarks. He has also worked on neutrinos (mass measurements and Earth tomography), the absence of antimatter in the Universe, how to discover the Higgs... 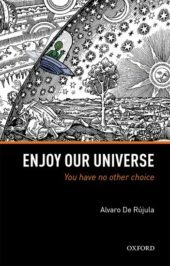 He is the author of Enjoy Our Universe (OUP, 2018).